Heart of Tota is the latest Point’n’Click adventure game from Robin Vencel. “You are an adventurer looking for a rare artifact, the ‘Heart of Tota’. 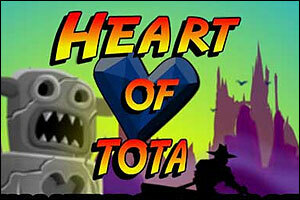 Heart of Tota video walkthrough! Nice little game, Finished with 58/60 coins but way too many clicks. One puzzle defied all logic for me but otherwise “do-able”. I thought these guys did kid’s games? That one was really quite sinister. I enjoyed it though. Oh goody goody, they give you a surprise (but don’t hold your breath lol)! Nice game and fairly easy. Watch out for the scare tactic in the mirror puzzle room. A real heart stopper. my heart card game inside the computer is unfair!!! Posted on Saturday, June 5th, 2010. Follow any responses through the RSS 2.0 feed.